The legendary SR-71 Blackbird spy plane was, and still is, the world's only operational Mach 3 aircraft, and was designed, built, and tested by Lockheed's famed "Skunk Works." 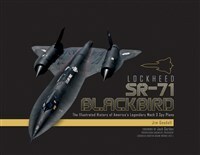 This new book covers all fifty Blackbirds built, from the first flight in 1962, to the last in 1999. As a replacement for the venerable U-2 spyplane, Lockheed went from contract signing to first flight in only thirty-two months starting in April 1958—from the beginning of design studies to the signing of a contract from the CIA to build the initial batch of A-12s in February 1960, to first flight in 1962. From the A-1 design through the completion of the very first Radar Cross Section models of the A-12, to the testing of every major system and subsystem, this book describes and illustrates the SR-71 as never before, using images from a variety of sources, as well as the author's own superb, new photography. Over the last thirty-five years Jim Goodall has authored more than two dozen books and articles on military aircraft, naval ships, and submarines with a focus on Low Observables, or as it is known today, Stealth.